PARIS, France (PAMACC News) - African environment ministers under the auspices of the African Ministerial Council on Environment (AMCEN) have restated their resolve to collectively demand for a binding legal agreement from the ongoing Paris climate conference. The ministers met today on the sidelines of the COP21 conference after a brief meeting with UN Secretary General, Ban Ki-moon. The meeting which was also a platform for ministers to get updates from the African Group of Negotiators (AGN) on the on-going negotiations was attended by over 50 environment ministers from Africa. In his speech to the ministers, United Nations Secretary General Ban Ki-moon, said though Climate Change is just one of the 17 Sustainable Development Goals (SDGs), failure to address it properly will result in failure to implement the other 16 goals. “It is critically important that we have a vision implemented in Paris. Africa is particularly vulnerable to the effects of climate change. Much of its economy depends on a climate-sensitive natural resource base, including rain-fed subsistence agriculture. This is an area of great opportunity for adaptation and mitigation,” Ki-moon said. Ki-moon commended Africa’s commitment to speaking with one voice in the negotiations. “I strongly encourage you to continue to do so. United, you are a powerful bloc of 54 nations, and your interests will be better served,” he said. Various ministers of environment from across Africa, forwarded their input to the agreement through the Africa Group of Negotiators (AGN). One thing that came out clearly during the ministers’ deliberations with the negotiators, was the call for Africa to speak with one voice to ensure that its needs are adhered to especially that Paris delivers a binding agreement. The ministers stressed that here in Paris they cannot afford to have another instrument like the Kyoto Protocol which was voluntary in nature hence enforced at one’s will. Bright Msaka, Malawian minister of natural Resources, energy and mining wants the outcome of the Paris climate change negotiations to be legally binding so that countries do not opt out of their duty to protect the earth and their people from the adverse effects of climate change. “We want a climate agreement that will obligate of all us to do our part. We are all on this one planet hence we cannot allow one country to spoil it for us,” he said. Msaka added that the Paris outcome should not have any element of volunteerism as was the case with the Kyoto Protocol which many rich nations such as the USA refused to ratify. According to Msaka, the insistence by Africa to have a legally binding document is because Africa bears the brunt of climate change even though its contributions to greenhouse gas emissions is insignificant. Those who pollute more appear unwilling to do more to reduce greenhouse gas emissions. 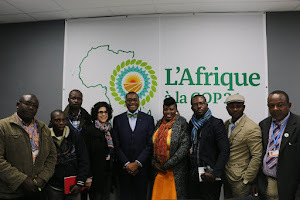 Akinwumi Adesina, AfDB president believes otherwise. To Adesina, the major and historic polluters must take a fair share of responsibility not only to cut their emissions, but also to help the suffering adapt to climate impacts as "all fingers are not equal." Uganda’s minister of water and environment Ephraim Kamuntu said Africa is not in Paris to beg but rather to demand what it deserves. “We are not beggars. The financial obligation we are asking is not charity its climate debt,” he said. 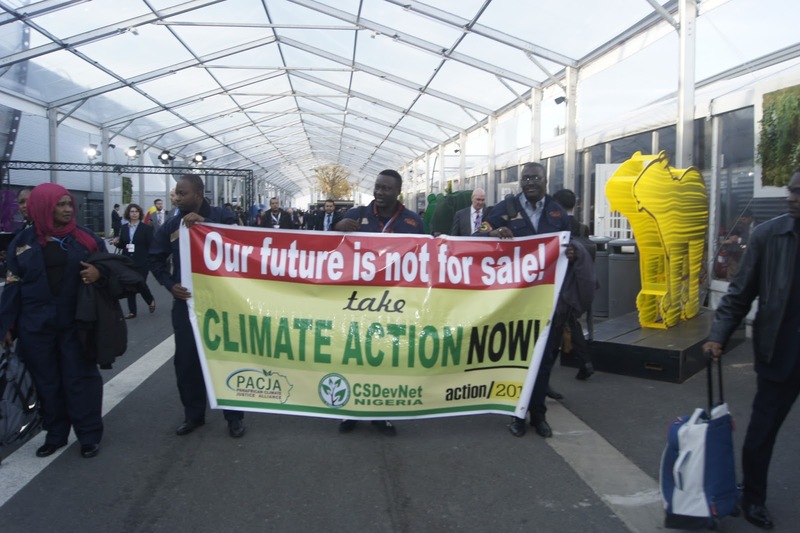 Augustine Njamshi of the Pan African Climate Justice Alliance (PACJA) hailed the stance of the African ministers and urged them to go all the way in ensuring that the African solidarity is not broken or compromised at the conference. "Our ministers must remain resolute and commited to the common African position. There must be no breaking of ranks," he added. 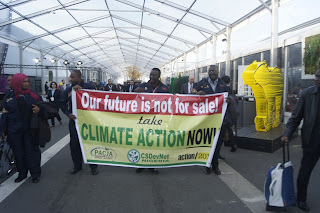 Issues of finance, adaptation, differentiation and loss and damage have dominated the COP21 negotiations, with Africa insisting that big polluters such as USA and others pay their climate debt to developing countries in line with its historic responsibility for climate change which comes with devastating effects on poor nations who have low capacity to respond and adapt.